But as Bruce Cumings eloquently explains, for the Asian world the Korean War was a generations-long fight that still haunts contemporary events. And in a very real way, although its true roots and repercussions continue to be either misunderstood, forgotten, or willfully ignored, it is the war that helped form modern America’s relationship to the world. With access to new evidence and secret materials from both here and abroad, including an archive of captured North Korean documents, Cumings reveals the war as it was actually fought. He describes its start as a civil war, preordained long before the first shots were fired in June 1950 by lingering fury over Japan’s occupation of Korea from 1910 to 1945. Cumings then shares the neglected history of America’s post–World War II occupation of Korea, the untold stories of bloody insurgencies and rebellions, and the powerful militaries organized and equipped by America and the Soviet Union in that divided land. 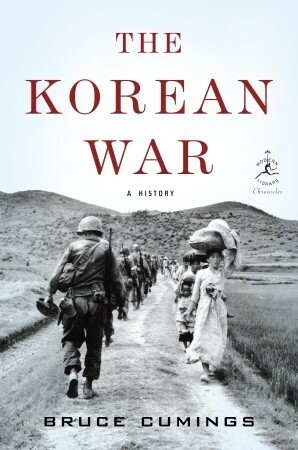 He tells of the United States officially entering the action on the side of the South, and exposes as never before the appalling massacres and atrocities committed on all sides and the “oceans of napalm” dropped on the North by U.S. forces in a remarkably violent war that killed as many as four million Koreans, two thirds of whom were civilians. In sobering detail, The Korean War chronicles a U.S. home front agitated by Joseph McCarthy, where absolutist conformity discouraged open inquiry and citizen dissent. Cumings incisively ties our current foreign policy back to Korea: an America with hundreds of permanent military bases abroad, a large standing army, and a permanent national security state at home, the ultimate result of a judicious and limited policy of containment evolving into an ongoing and seemingly endless global crusade.